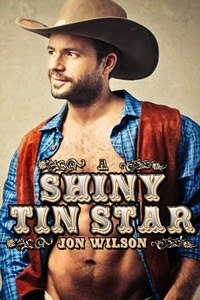 Back in April, I read A Shiny Tin Star by Jon Wilson in one sitting. It made the top of my list as a favorite book of the month, and I've already re-read it once since then. A Shiny Tin Star was originally published by Cheyenne Publishing in 2012 and was well received with excellent reviews all around. I can definitely understand the reason behind those reviews. Lethe Press is re-releasing a few select books in July of 2014, this is one of them. Personally, I'm glad that Gene and Forest's romance won't be lost to future readers. This historical western romance is set in Creek County, Colorado at the turn of the century in 1903, so it's a different sort of western. Townspeople are settled, the law is enforced, and there's not much of the "wild" left in the West. Sheriff Eugene Grey, a local, has matters under control and lives a relatively peaceful life until the young, arrogant Federal Marshal Forest O'Rourke shows up with an ancient wanted poster looking to arrest a local resident. "I considered punching Forest O'Rourke in the face, the first time, about two minutes after making his acquaintance." The narrative in this novel is strictly from Gene's first point of view perspective. 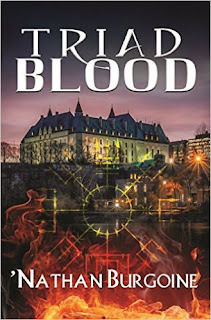 It is quick witted, engaging, and absorbing throughout the novel, so of course I immediately fell in love with Gene Grey's voice and character. Not so much with young, arrogant Federal Marshal Forest O'Rourke or his brand new shiny tin star. That changes as the story unfolds and Gene exposes Forest's truths and vulnerabilities. "Still, I gave him the benefit of the doubt that day for a couple of reasons, though mostly I claim I was bedazzled by the sunlight sparkling off his shiny, new badge." Gene and Forest's story is divided into three parts. It begins with "The Law & Rawley Scoggins" and includes that first meeting, Forest's stubborn determination to arrest the old-timer, the disturbing end to those events for Forest and old Scoggins, and a few days of intimate acquaintance for Gene and Forest. Conversations lead to unexpected private revelations from both sides, particularly from Gene who finds himself attracted to young Forest and takes a leap by answering with the truth when asked why he is not married: "Because I like men, not women." What follows is a beautiful seductive scene where Forest takes the lead. This is a favorite scene where a tentative physical move with an almost tender quality builds into full-blown lusty passion between the two men. I found the depiction of this scene to be excellent, specifically in how well Wilson conveys sexual tension, lust, passion, and the emotions involved, without going into unnecessary minute graphic or explicit details. In the second part of the book, "Diotima's Child," Forest returns to Creek County under false pretenses and moves in with Gene as his lover, eventually becoming Gene's temporary deputy. This section details a joyful period for Gene and Forest filled with passion and love. Their relief at having found each other, however, makes them a careless pair, so it's no surprise when all ends badly and the lovers end up making their way to Atlanta and Philadelphia in the final and, to my way of thinking, strongest section of the book "Lonesome Trail," where loneliness and terrible despair awaits them. And where Gene risks breaking the law, prison, and death for love. Wilson's characters are a study in contrasts with Gene a confident, educated, working man from the West and Forest a hot-headed, almost illiterate (not-so-bright) well-to-do gentleman from the South. Needless to say, characterization is fine tuned as well, particularly Gene. Through Gene's narrative the reader experiences the full scope of the novel, as well as the inner workings of a self-assured man plagued by loneliness whose passionate love leads to such raging turmoil and despair that he will do anything for a smidgen of hope. To a lesser degree Forest's character, the man who inspires such passionate love, is also well rendered as he evolves throughout the novel. Wilson humanizes the characters by portraying their strengths and vulnerabilities during different sections of the novel, making them fit with each other, as well as with time, place, and setting. A Shiny Tin Star is a romance with a happy ending. This historical western is memorable for its characters, its witty, engaging, straight-forward narrative style, and a sweet, passionate romance with conflicts that fit the historical period. It ends with one of the best memorable, quotable, last lines I've read in a long time. I would quote it for you, but don't want to spoil it. Read the book and find out! Sonia, in that second section the despair and emotion is overwhelming. Such a contrast to the joy and hope in the first section of this romance. I really liked that Wilson didn't diddle around making it easy for two men living in this time period (and in these places) to find that HEA. But, that last line, although witty yes, represented that HEA for them. How they would work that out was explained in a previous chapter by Gene -- he had the plan in place before Forest took that false step. I think that maybe an "epilogue" would have worked for you in this case? It was really special to read. I understand where you are coming from Sonia. A little closure doesn't hurt. :) I am so glad you enjoyed it. I have A Hundred Little Lies in my TBR, Wilson's first novel and also a western historical romance.